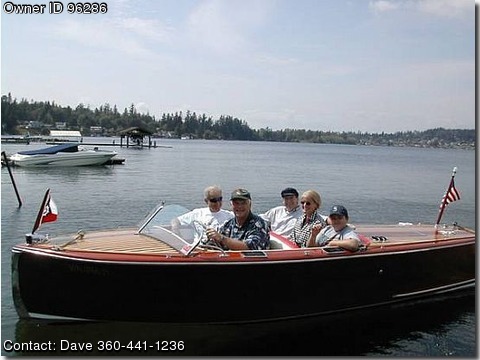 Please contact the owner directly @ 360-441-1236 or drpauley(at)gmail(dot)com.Classic wooden boat completely restored. We have use this boat on Lake Whatcom every summer since restored. 17'6" in length, Rebuilt original Gray marine phantom 104. New West System double plank bottom installed 2003. Engine and transmission re-build in 2004 and 2006. I have the complete history and photo's of the boat and it's restoration. Custom built 1985 walk around trailer included. Santa Claus even used this boat! Willing to consider trades for 20-24 foot fishing boat or classic car.